Warren Buffet and Rakesh Jhunjhunwala are known as Stock Gurus. Many Investors today follows them blindly to make a stock market portfolio. We have already discussed Rakesh Jhunjhunwala portfolio and method followed by him for selection of stocks. 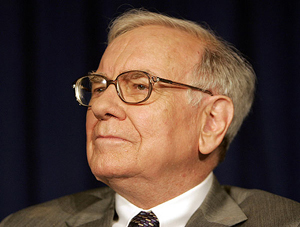 Today we will discuss Warren Buffet Investment philosophy and method to identify multi-bagger stocks. It is known as Basic Screen Test of Warren Buffet. Warren Buffet only invests in a business where future business earnings are certain. The company must have positive earnings growth for the past seven years. If growths are sustainable for seven years it is most likely that growth story will continue in future. Warren buffet investment style says that average earnings growth of the past three years should be higher than the average growth of the past seven years. This is Buffett’s way to compare the medium-term growth rate to the long-term growth rate and look for an expanding bottom line. Another rule of warren buffet says – The Return on equity should be higher than the industry average, preferably above 15%. If stocks pass this basis screen test, warren buffet tries to project possible future earning and possible dividend payout from the historical data of EPS and dividend. Finally, warren buffet selects the stock if projected return is more than 15% every year. It is very difficult to identify stocks from Indian stock market using warren buffet investment strategy; however, ET has identified 12 Indian stocks that pass warren buffet basis screen test. 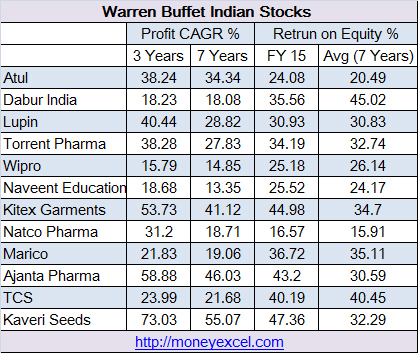 12 Indian Stocks that passes warren buffet screen test are Atul, Dabur India, Lupin, Torrent Pharma, Wipro, Naveent Education, Kitex Garments, Natco Pharma, Marico, Ajanta Pharma, TCS and Kaveri Seeds. Among these stocks, Navneet Education reported the lowest average earnings of 13.35% while Kaveri Seeds reported the highest growth at 55.07%. The study made here is wonderful and it is surprising to see some very low profile names in the list. These rules are basic, it does not include anything about valuation and cash flows which are also important for selection of stocks. You can follow the strategy of stock gurus like warren buffet or Rakesh jhunjhunwala, however, it is your responsibility to do proper study and research before making any investments. Blindly following recommendation given by anyone is very risky.